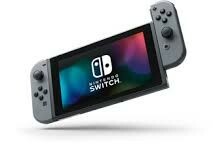 The Nintendo Switch was first announced in October 2016 and released on March 3, 2017, being a focus of excitement as many hoped the console would live up to how Nintendo spoke of it. The main feature is that the Switch is a hybrid console, giving players opportunities to play like they would with handheld and home console all in one device. The console itself is mainly a tablet with a 1280 x 720 resolution and a Joy-Con on each side. Along with the tablet is the dock that, when connected to a TV through an HDMI cable and given a proper power source through its charger, allows the console to switch to a TV display when the tablet is placed in the dock. The Joy-Cons also have the ability to be disconnected from the tablet, allowing for play in TV mode or paired with the tablet’s kickstand for a tabletop experience. A nice detail to note, though, is when the Joy-Cons are placed back on the system while it’s on, the console plays the snap sound so closely associated with the Switch and the commercials involving it. On September 18, 2018, the Nintendo Switch Online service was released. The online service only costs $20 for one year, $40 less than the $60 fee for Xbox Live and PlayStation Plus. During a Nintendo Direct presentation on September 13, the perks for the online subscription were revealed. The service would come with free Nintendo Entertainment System games, new titles being released each month, and the addition of cloud saves. Cloud saves are a nice touch, backing up the game progress to the player’s Nintendo account; if anything happens to the system, the player can recover the progress on a new console with most games. If the player is a fan of games like Splatoon 2, they’ll just have to hope their console never gets damaged as that is one game not included in the cloud save perk. The system has its own ups and downs, such as the USB-C port being on the underside of the tablet. If the player wants to charge while playing in any portable mode, they may want to settle for handheld instead as the cable makes it impossible to keep in its tabletop mode. The system also doesn’t feature its own microphone, depending on the player to download an app on their phone just to use a voice chat to talk with the other people in online play. In the end, though, the system really feels worth it even after it has been out for almost two years. With so many new game releases coming this year, it is a bit hard to hold too much against the console. Most issues can be worked around after getting used to the system itself, which is rumored to be getting a new hardware release. Andrews, Stuart. “Nintendo Switch review – The most exciting game console.” Trusted Reviews, https://www.trustedreviews.com/reviews/nintendo-switch. Accessed 18 January 2019.
https://www.youtube.com/watch?v=K0D2xAI2TqA. Accessed 18 January 2019.
https://www.xbox.com/en-US/live/gold. Accessed 18 January 2019.
https://store.playstation.com/en-us/product/IP9101-NPIA90005_01-1YEARPACKAGE0000. Accessed 18 January 2019.